The 2010 Los Angeles festival takes over L.A. LIVE June 17-27th! 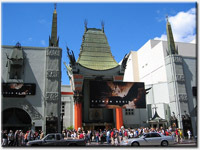 Featuring over 150 screenings in 8 digital state of the art auditoriums including the Premier The 2010 festival takes over L.A. LIVE June 17-27th! Don't miss this year's galas, film screenings, conversations, and coffee talks with the most influential artists in music and film! Sit in on conversations with Ben Affleck and Hollywood legend Roger Corman, and watch the premiere of music videos at the GRAMMY Museum Sound Stage. Tickets are on sale now and going fast! Petit Ermitage West Hollywood Hotel - RATES: $198 Junior Suite | $239 Executive Suite - BOOKING CODE: American Spirit – Must book via phone to receive special rate.